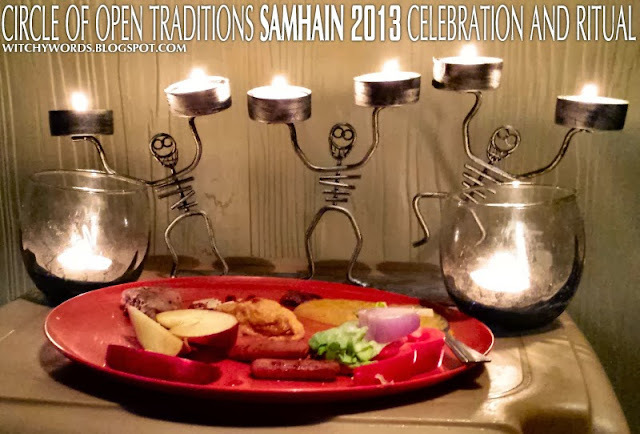 This post will cover the Samhain 2013 celebration and ritual by Circle of Open Traditions. 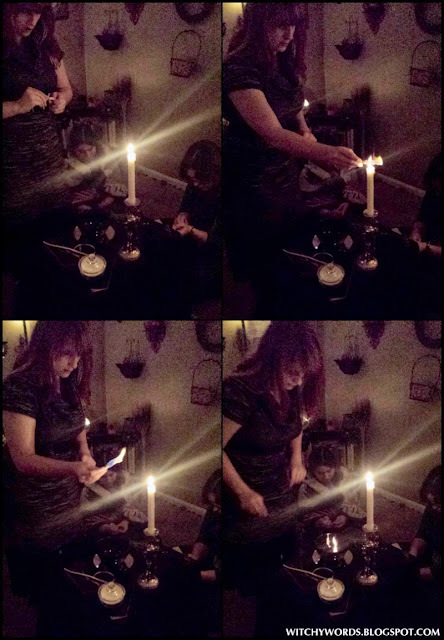 The first portion of all of our rituals includes lighting the altar. 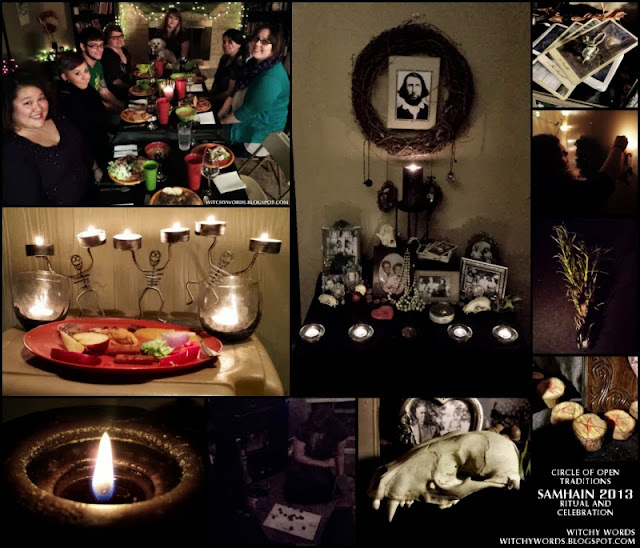 For Samhain, each member brought an item to honor a particular loved one. 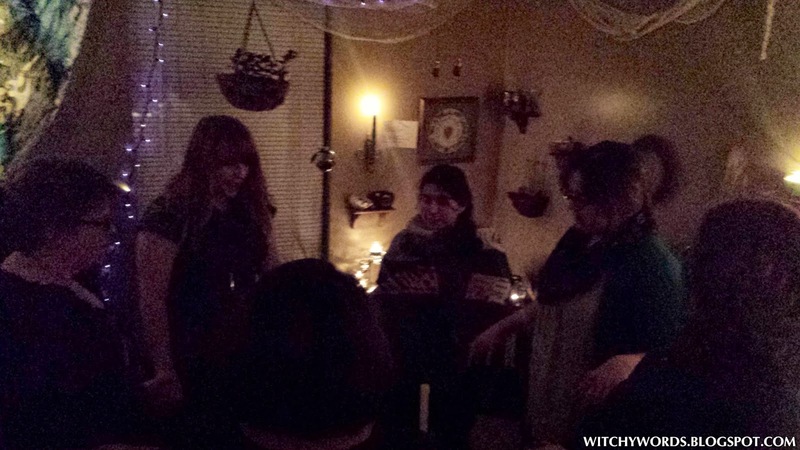 Everyone explained who their item was for, then lit a candle or stick of incense. 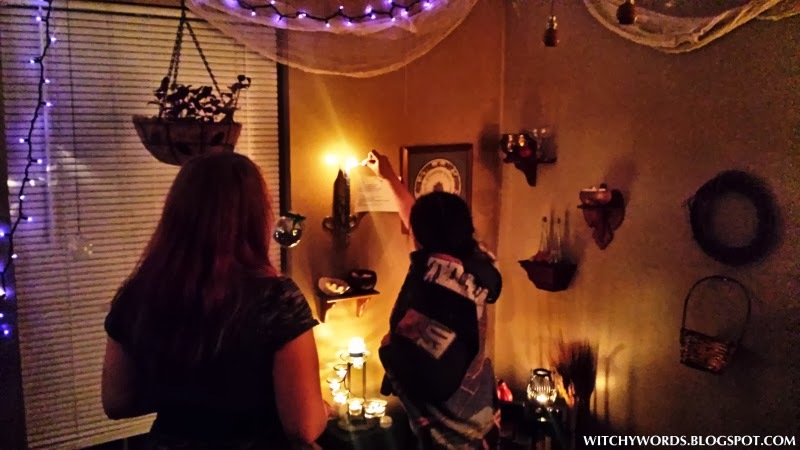 I avoided having pictures taken of other members because it was relatively emotional, but below you can see my altar placement and candle lighting. I honored Nyx, who passed away last year in November. The strain in my face is relatively evident. For more pictures of my Samhain 2013 altar, click here! 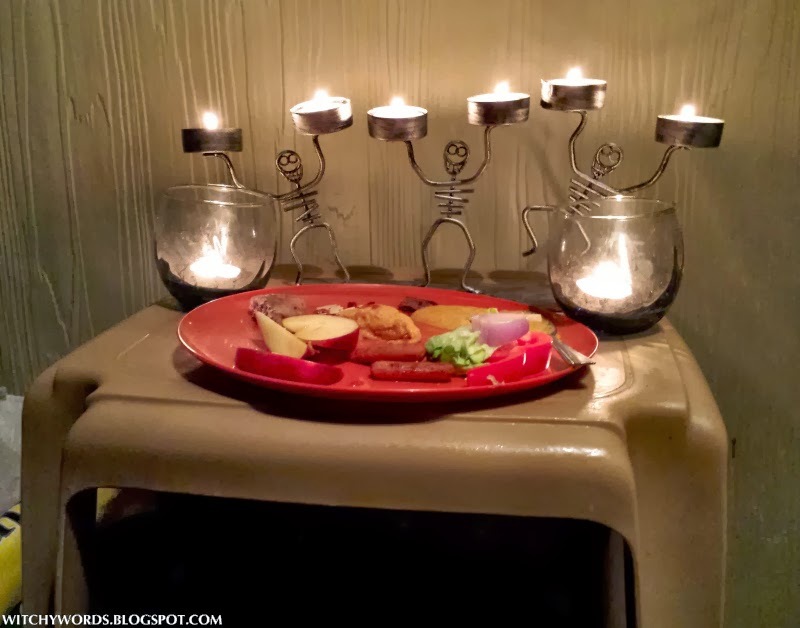 After we lit the altar, we placed a plate of food outside for the spirits. 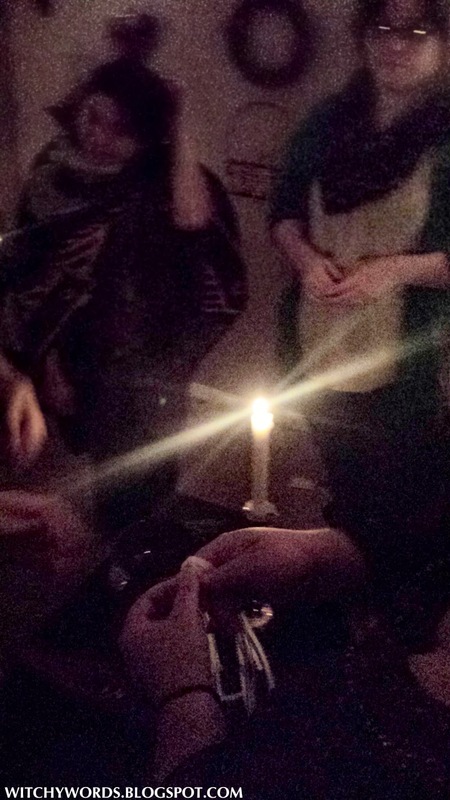 Each one of us also lit one candle in honor the spirits and ancestors who walk the land while the veil is thin. 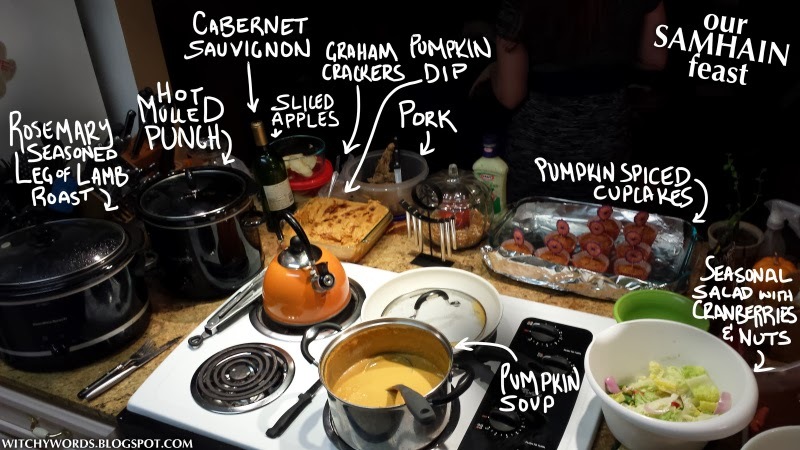 In addition to the food above, my husband made his Pumpkin Nutella Cheesecake. On the same day, his cheesecake won the dessert contest at his company, so I can even say it was award-winning! 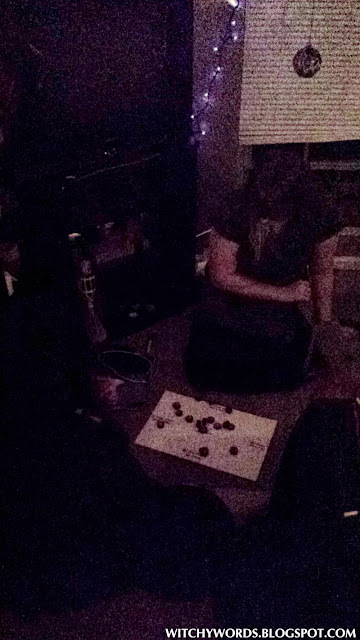 This is the last picture we took with a light on. 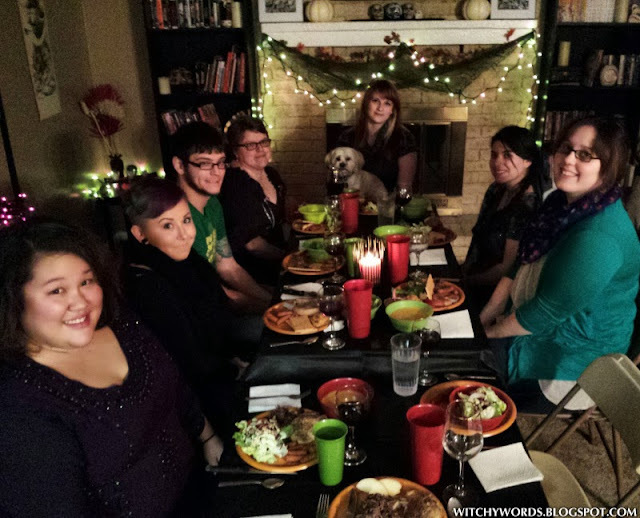 After this, we dined in the dark by the light of our string lights and the candle. As with last year, I thought briefly about doing a Dumb Dinner, but I can't imagine all of us managing to not talk for an hour! We're a pretty chatty group. After the dinner, we briefly visited and then headed to the spiritual room to open the circle. "As above, so below. The powers spin and our magick holds." We began by passing the rosemary, a tradition where each of us briefly holds the bundle of rosemary and thinks deeply of the loved one we are honoring tonight. We also took a moment to step forward and state that loved one. 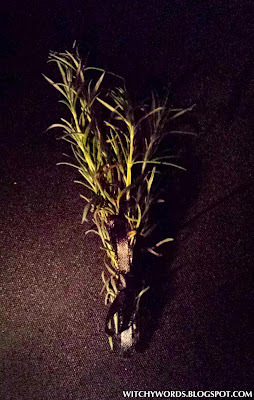 We then continued to the braiding of the ribbon. 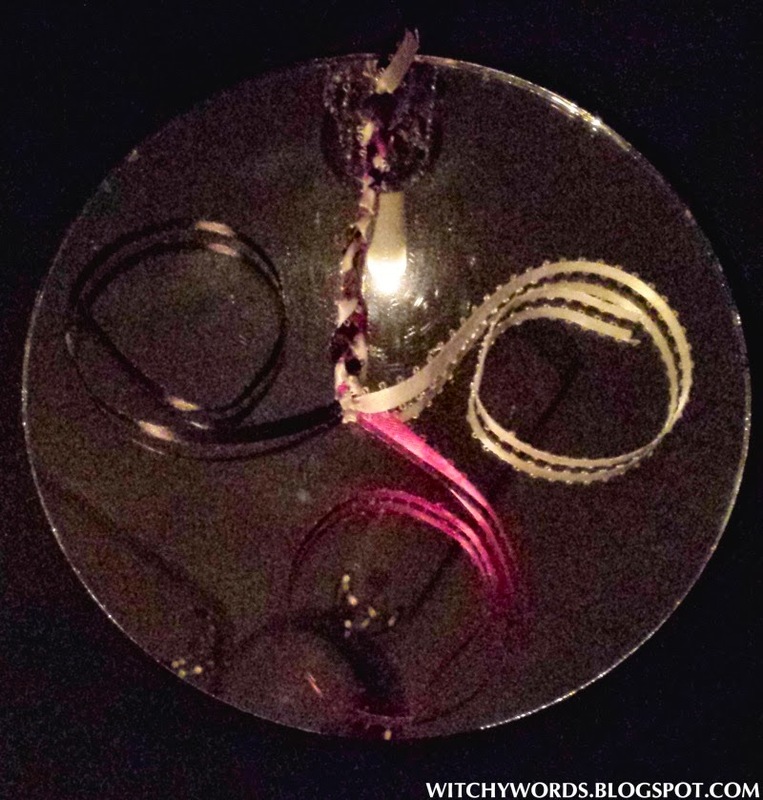 In this spell, you take three colors of ribbon. Black represents death and white represents life. You knot them together with red, which represents rebirth and completes the cycle. We then looked towards the future. Using small slips of paper, we wrote down one goal we wanted to accomplish. 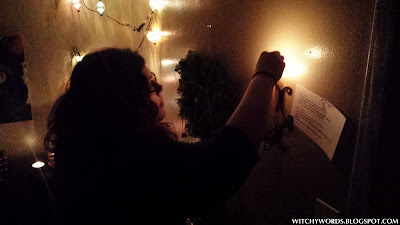 Each person burned their slip of paper to send out their hopes, dreams, wishes and goals to the universe. 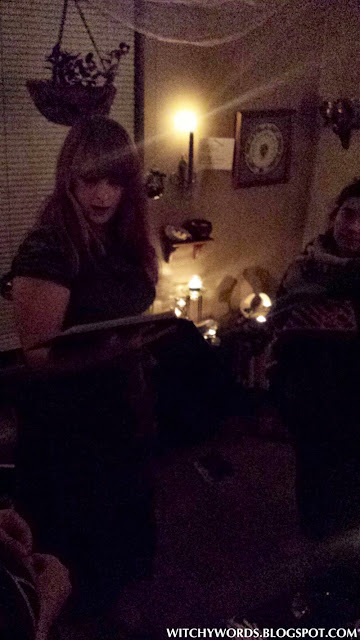 Finally, we had a small poem reading to close down the primary part of the ritual. 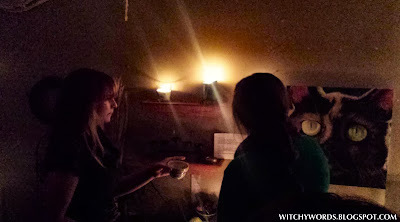 I then released the circle to forms of divination, a pertinent part of our Samhain celebrations. 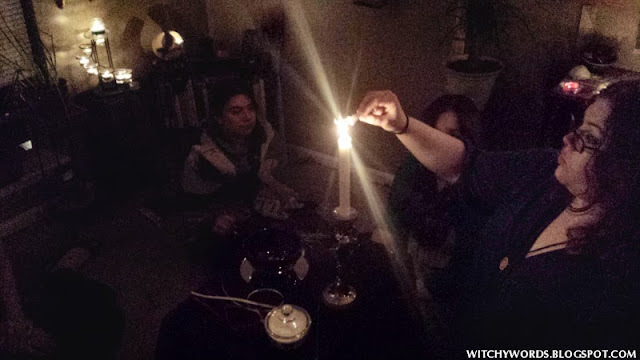 Below is a picture of me doing a rune reading for a fellow circle member. And that completes our Samhain celebration! 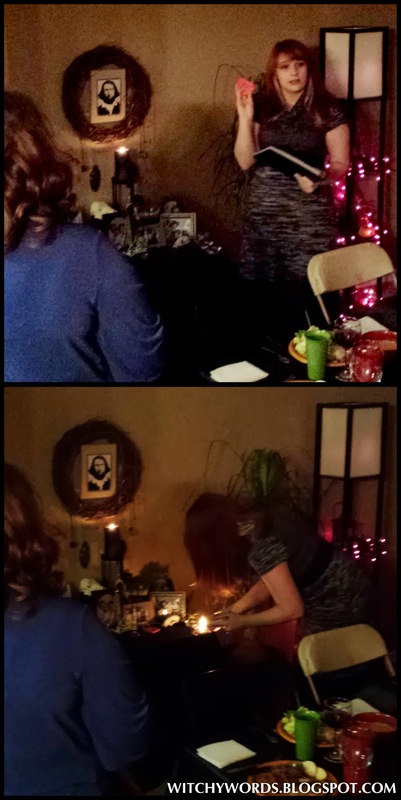 I apologize for the graininess of the photos; our camera acted up throughout the entire celebration. 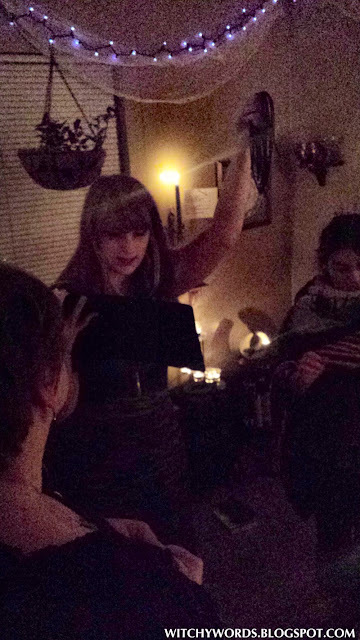 Still, I hope it gives you an idea of how we celebrated this sabbat. 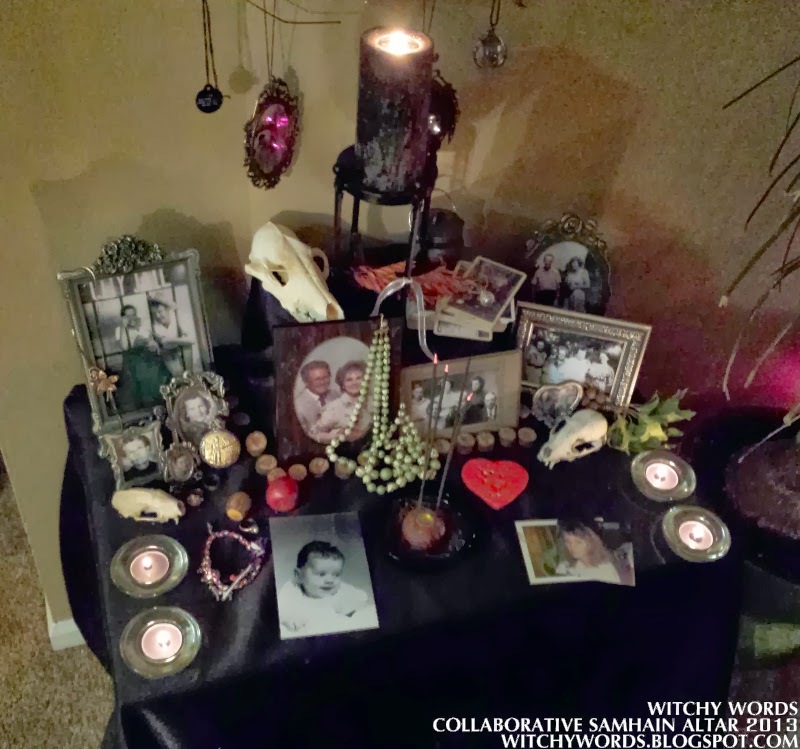 You can see last year's altar and read about Samhain 2012 here! What did you do to celebrate Samhain? I stumbled up on your blog today & I'm in awe!! I am new to the pagan path- started my research last May. I've begun vlogging my journey on YouTube which has led me to many great teachers and friends. I would love to mention your blog in a future video- with your permission. Thanks so much for sharing your journey!! Thank you so much! You are most welcome to mention my blog in your video. In fact, I'd love to see your vlog if you'd like to link it! Best of luck on your journey! 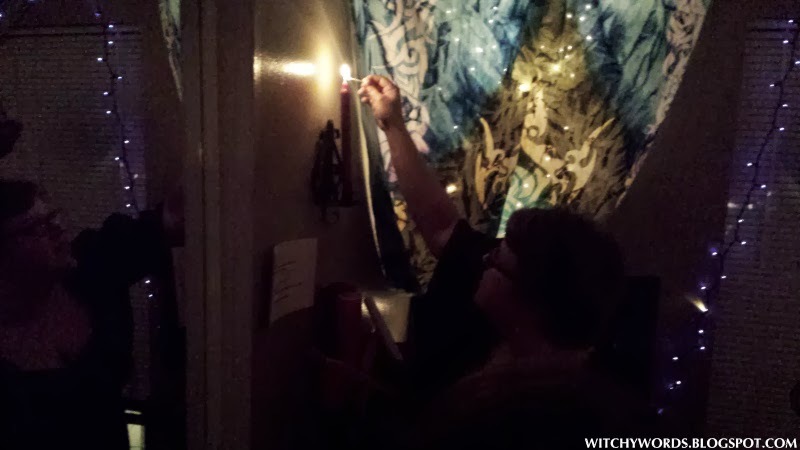 My YouTube channel is: monsoonmagick.